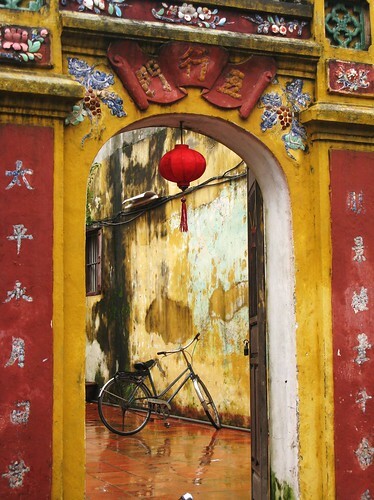 Years ago Jesse, a native San Franciscan, met Sarah, a Brit, in charming Hoi An, Vietnam. A few visas later these two good friends of ours tied the knot – unfortunately Lauren and I missed the big wedding, which happened during our travels. Sarah and Jesse have been very supportive fans of my art. Besides babysitting some of my paintings that didn’t fit in storage, they also put some of my paintings on their wedding registry using Artmigos.com, a neat tool makes it easy for multiple people to chip in on one art gift. When Lauren and I visited Hoi An, the historic riverside town was flooded with a couple extra feet of water while we were there, but I chose to focus more on the charming architecture that earned Hoi An its UNESCO World Heritage designation. 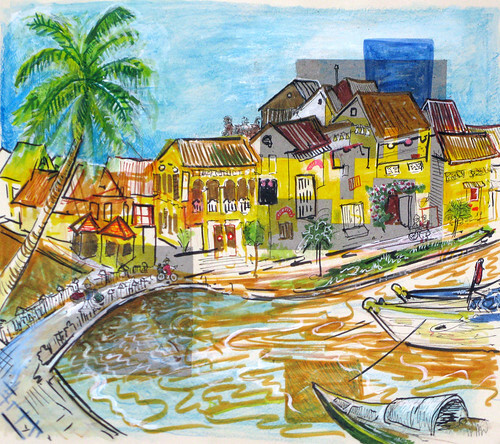 To create this drawing, I used pencils, markers, acrylic medium, and a couple square gray napkins that came with a banana fritter I bought in Hoi An’s damp and crowded Central Market. There must be something special about Hoi An since Jesse and Sarah found each other there and we found some kindred spirits as well. While I was drawing this picture, Lauren was off at a cooking class where she met Cam and Nicole. We spent that night with them eating cau lau – a local chicken and wide noodle dish – from an alley-based food vendor, then headed to a very American-style bar for hours of conversation over lots of Bia Hanoi and Dalat red wine. Though Thai politics would foil our plans to meet up with Cam and Nicole in Kho Phi Phi, we will surely see these two Canadians again.